These simple homemade pickles are ready in just hours. Learn how to make pickles at home instead of buying them at the store. I’ve got a pickle, I’ve got a pickle, I’ve got a…..yeah, that’s been in my head since the first cucumber slice. Perhaps the only downside to this little homemade pickle making adventure. So did you know how easy it is to make pickles?! I had no clue. I see something that has to do with jars and I freak. Hence why canning and I have not yet rendezvoused. In fact, even after slicing and throwing everything into the jar on Tuesday to chill out overnight, I was still freaked about tasting them yesterday. There’s something about soaking a vegetable in the same liquid I use to un-clog my coffee maker from calcium deposits (aka white vinegar) that just seems gross. Right? When it can be used as a cleaning agent, it just seems logical that it shouldn’t be eaten. If you’re a pickle person, I’m betting you’re probably a fan of kimchi too so don’t miss this bulgogi kimchi rice plate or this kimchi potato hash. Honestly, these were a total fly by the seat of my pants (dumbest saying ever, I mean whose pants have seats and how the hell are they flying?) kind of thing. Peppercorns and anise seeds sounded about right for flavor. Garlic was a must. And then I got crazy and threw some basil in there too. Woooah. Ratio wise, I measured things, but I had no rhyme or reason for the amounts of vinegar and water I used. These simple homemade pickles were crisp, tangy and perfectly spicy when I pulled them out of the refrigerator 12 hours later. Although, the longer they sit the more tangy and “pickle-like” they get! This video shows how to make spicy garlic dill pickles (try those too, the spice level is totally optional/adjustable to your taste!) but the method for these basic homemade pickles is exactly the same. Feel free to change out the spices and herbs to what you have on hand and what you like. As long as you have some peppercorns and garlic, you’re pretty much set for a basic pickle recipe. You can pickle lots of things like blueberries in this pickled blueberry panzanella salad, or mushrooms in this balsamic pickled mushroom crostini and even fruit like pineapple in this spicy pickled pineapple but nothing is as simple and perfect for a snack like a simple homemade pickle. Crisp and tangy pickles make a great addition to so many lunches like a chicken salad sandwich or my all time favorite sandwich on this site, a roast beef smoked gouda grilled cheese. And they totally level up some healthy sloppy joes too! It seriously could not be any easier. I have a feeling these are one of those “hard to mess up” kind of things but I prefer to think that my combination is just that awesome and ignore that. 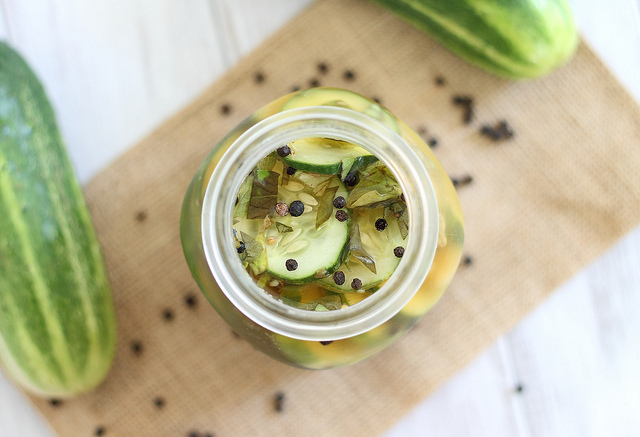 And if you’re into homemade pickles, make sure to check out my post on How to Ferment Vegetables too. Love the probiotic boost they bring to my diet and they’re just as simple to make! These simple homemade pickles are ready in just hours. Learn how to make your own at home instead of buying them at the store. Combine vinegar and salt in a small bowl, whisk together. 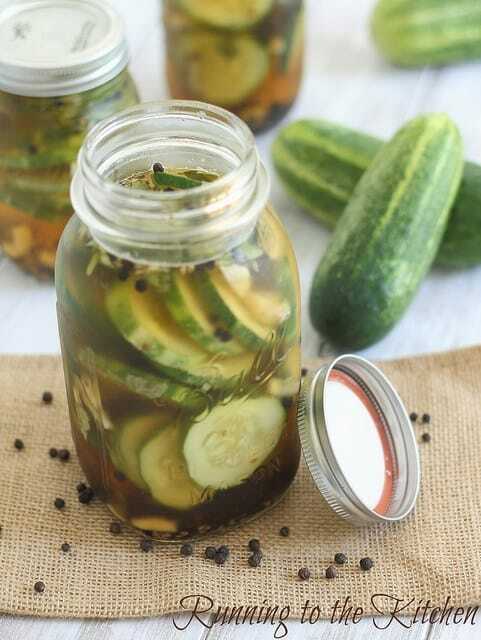 In a large mason jar, add cucumber slices. Add garlic, basil, peppercorns, anise seeds and bay leaf. Close lid and refrigerate for at least 8 hours before eating. I have to make these! I always wanted to make homemade pickles. I guess I”ll pick some cucumbers up from the Farmers Market this weekend!! I can’t wait to try it!! I don’t know why it never occurred to me to make my own pickles. Might have to give this a go. I know my favorite produce lady at the market has pickling cukes. omg I love that movie so much. Now I’m going to be singing that all day long here. I’ve been making pickles all summer and I seriously cannot get enough! haha yeah I actually always thought pickles took like 2 months of fermenting…… I know nothing clearly. I didn’t know making pickles could be so easy! I always thought you had to boil the jars before and then boil them closed or something. I can’t wait to try this. Pickles and fermented food can do no wrong. LOVE IT! I made countertop pickles like this a few years ago and reminds me I need to get back at it. That tangy-ness, mmm, love it. I was literally just thinking I need to make my own pickles! I made some dehydrated zucchini chips yesterday – soaked them in some white vinegar, olive oil, and lots of dill. They reminded me of those random pickle-flavored potato chips I see every once in a while. And I actually thought the same thing about vinegar. I bought a giant bottle that I’ve been using to clean counters, glass, Olive’s peeing on the rug incident, as a fabric softener (it actually works)…basically, what can’t white vinegar do? A fabric softener?! Craziness! I’m trying that next! I pour about a cup in the fabric softener compartment. It’s not quite the same as the conventional stuff, but I found that it’s awesome at getting rid of the stinky gym clothes smell! Aren’t pickles the VERY best? I made some a few weeks ago and I’m still enjoying them :) Also. I think we are the same person. Hehe… I love Little Rascals. um, i’m in lust over these. I’m with you on canning…I totally want to try it but it terrifies me at the same time. Good to know pickles are so easy, though! I just ordered some mason jars and this might have to be their maiden voyage. Win!! This came right into my reader, so happy it was an easy fix! 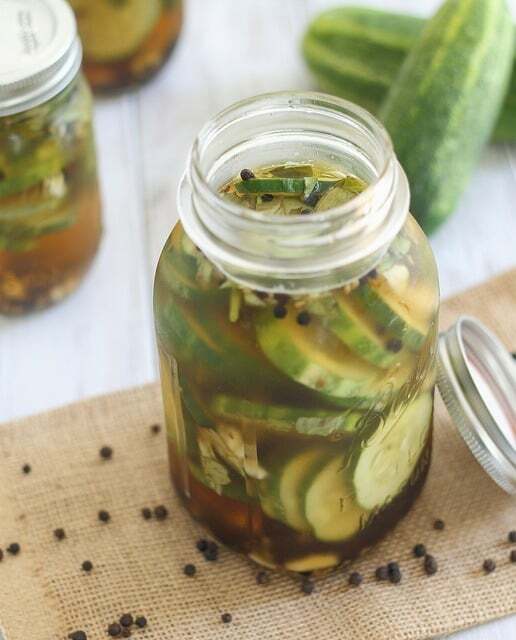 I tried homemade pickles before but the process was so much more tedious than this (and also left me pretty frightened to taste the finished product) – this recipe looks perfect, going to make a batch tonight! YAY! Looks like they came out perfectly! As I mentioned on Instagram I have been obsessed with refrigerator pickles lately. Like I seriously cannot get enough. So easy. The last batch I made, I had extra brine so I quick pickled some carrots and they were incredible!! After reading this I just threw some carrots into my extra brine. Great idea! I really have a fear of canning too… All the boiling stuff kinda freaks me out. But I found this zucchini pickle recipe from Zuni cafe and made it… It was easy pickling, just right up my alley and was so good! It required too much vinegar and sugar though so I cut the recipe in half figuring that if I just stir every now and then, all the zucchini slices will be soaked in the sauce. Love that there’s no sugar here and love the basil too! Pingback: Dill Cucumber Salad : Yes, I want cake. GINA, this looks so good! I love Pickles . I’ll have to try this out sometime soon. Thanks for sharing! Gina, What a great idea! Love this. I’m sure this is incredibly delicious! Gina, it looks so yummy! I love the step-by-step instructions, making it an easy recipe to follow!